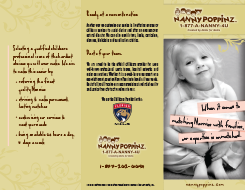 If you are interested in a successful career as a Nanny while making a difference in the lives of Southeastern Michigan area families, then Nanny Poppinz has the job for you! Since 1992, Nanny Poppinz has helped thousands of Nannies find jobs with families who appreciate true quality childcare. Additional Requirements:: We are looking for a mature, professional, and experienced full-time nanny to care for our 5 year old daughter and newborn baby. Our daughter will need rides to/from school. The nanny would provide full-time care for our newborn/infant. Priority is child care during the day, but assistance with laundry, dishes, light housekeeping, and light meal prep for kids would be appreciated as well. Flexible with Start and End time on occasion. Cleaning Duties Details: Keeping house tidy and doing dishes. Additional Duties: We will need help with light housekeeping, laundry, and light meal prep. Pet Description: We have an older dog that just needs to be let out a couple times a day and a few pats on the head. Cleaning Duties Details: Just cleaning up whatever you use during the day with the kids. Who is responsible for the pets: Nanny. Additional Duties: We are looking for a Nanny for Mondays, Tuesdays, and every other Wednesday during the school year (Sept-mid June). We have an older dog that just needs to be let out a couple times a day and a few pats on the head. We want the nanny to focus most of their time on the kids with some possible light housekeeping or meal prep (this is negotiable). Additional Requirements:: We will need someone to get Will (in Kindergarten) off the bus and take him with you to get Van at preschool. Then to bring them both home until my husband gets home from work. Pet Description: Two medium sized dogs. Very good with people. Nervous with other dogs. We have a fenced back yard and the dogs do not need much attention on days when you are at our home doing childcare...just let outside every so often when then want to go out. On days when they are home alone, they are crated and will need to be walked midday. We would prefer if the candidate would be agreeable to walk them on these days as well, but we have a current dog walker we use if this is not a possibility. Additional Duties: We need help on every Tuesday, Wed, and Friday with dropping children dropped off at school/daycare. We also would like our dogs walked midday on these days if not doing childcare. On Wed we need children picked up and watched in the evening. We need full and consistent availability on these same days in case of illness and/or snow days to watch children all day. Also, we need occasional (uncommon) weekend evenings for child care for social events. We also need help with housework and errands when not doing childcare...ie groceries, dry cleaning, take car for oil change, etc. Additional Requirements:: I am interested in find out more about your services as we begin our search for a full-time nanny to start this coming spring.